TONI&GUY hairdressers in Inverness opened in 2006. As a salon we pride ourselves on delivering the highest standards of customer service to each and every client. Our talented team of stylists and technicians are on hand to give you expert advice and create hair that is individual and easy to live with, interpreting fashion trends with versatile wearable styles. We offer many additional services including Bridal and Occasion hair and the NanoKeratin Smoothing blow-dry. 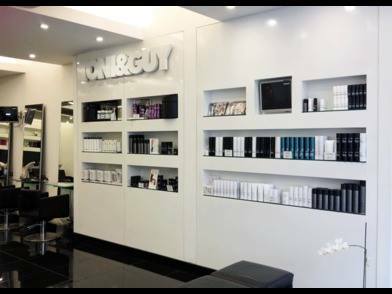 Our wide range of haircare products includes label.m, Kerastase and GHD to keep your hair salon perfect until your next visit. For more information on our services please speak to our friendly team who will be happy to help on 01463 713582. Fantastic cut and colour as always. I left the salon feeling fabulous. Love my short, smart hairstyle. Thank you Emma once again for a super style and for cheering me up!. Thanks to Jessica for relaxing shampoo. Excellent service provided to my mom, daughter and me by Julia and Louise. I couldn't have asked for more. I wasn’t sure at first about how short my hair was but now that I’m used to it I love it. A very good cut by *****. My only criticism and it’s not just *****, I’ve had it from other stylists in here previously,, that they constantly ask you what you want (i.e. anything off the fringe, how do you want the back, do you want me to texturise this section and the answer is normally I’m not sure. They are the hairdresser and I feel they should give advice of the consequences first or ask if they should just proceed with what they think will look best. I am very happy with my highlights. Julia was very efficient. Another excellent hair experience from Emma and her team at T&G Inverness. Emma and trainee Jessica always make me feel welcome. I’m very happy with my bob cut. I rushed in so stressed but left very relaxed. I want that magic wand! Thank you so much for delivering amazing experience again. Left the salon on Friday with my hair looking great and it still looks great, two days later. Thanks Emma! As always, Emma makes me look amazing. It's a great place to be pampered. Max understood what I wanted and explained how he would do it then efficiently delivered. I'm delighted and will be back. Always happy with my results and would highly recommend Emma as she clearly knows her stuff. All the girls are very friendly and are very welcoming. Great service. Thoughtful, kind, and excellent at colour, and styling! Love Emma! Thanks again, it’s always a pleasure to visit. Always feel amazing leaving the salon . Great cut again from emma love it ???? Just the best and Emma is such a wonderful stylist!